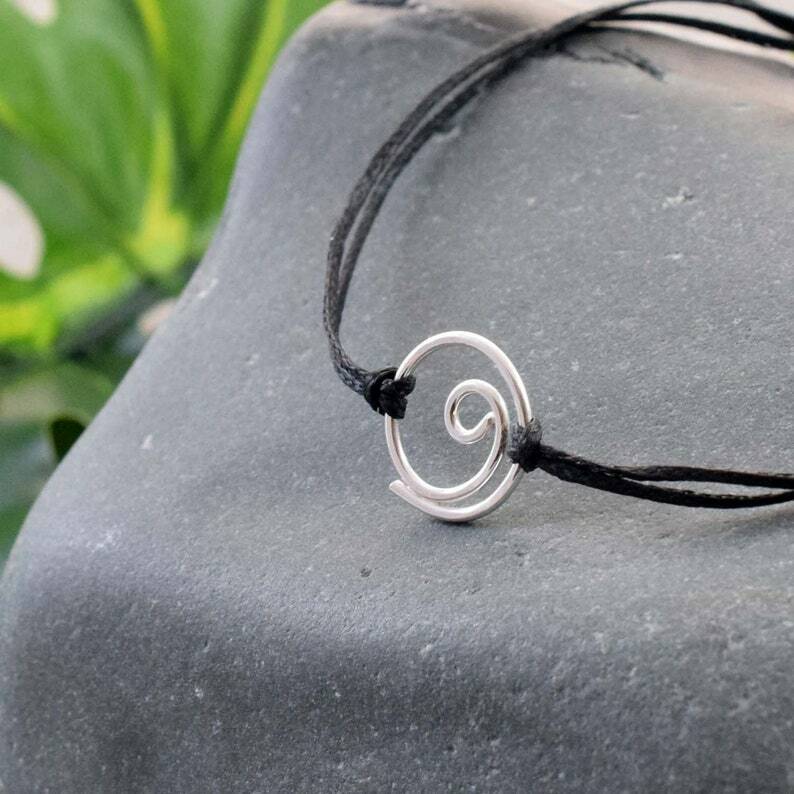 This beautiful delicate handmade Sterling Silver Gratitude bracelet is a wonderfully mindful addition to any collection! I have hand forged, shaped, soldered and finished this small sterling silver symbol for gratitude. It is 100% made by hand, so each sweet little symbol is absolutely unique! The gratitude symbol is approximately 1.2 cm in diameter and is completed with durable waxed nylon cord and an adjustable box knot closure. Simple, Subtle and So very versatile! A perfect gift for that special someone; for him, for her or yourself! Great worn alone or stacked with your favourite bracelets. Lightweight and easy to wear. This symbol signifies Gratitude and the trait of being thankful. When you genuinely believe and practise gratitude you have a connection with the world and the universe. It is a state of being of which each of us has full control over no matter our circumstance or personal experience. Gratefulness allows people to appreciate what they have in life even if it is not what they think they want or need. This acknowledgement and acceptance of thanks can help us all positively in our everyday life. A perfect & thoughful gift for someone special - a personal note can be added to the recipient, just let me know what you would like written! USA: 12-14 Business days. Europe: 8-10 Business days. Silver can tarnish and yellow so please try to avoid storing in direct sunlight. Perfume sprayed directly onto jewellery can also affect silver and some threads. Please note, the above are estimated times given by the Post Office. Unfortunately once it leaves my hands here in Cyprus I can't be held responsible for any delays due to issues regarding weather, customs or the occasional strike ;) around the world etc. From experience international postal services have been very reliable and on many occasions buyers have received orders earlier than expected. Thanks for the understanding! Wonderful wonderful seller. Well made bracelets. What a magnificent band. I really enjoy wearing it, it’s really well crafted. The seller is responsive and simply a great one to deal with. All in all it has been a pleasure. I want each buyer to be completely satisfied with their purchase. I do my very best to make sure my listings are as accurate as possible; please pay attention to size measurements. If you are eligible for a refund please return item in unused condition within 14 days. I will refund (excluding shipping costs) or exchange for another item of the same value. Please note that you are responsible for return shipping costs. Custom orders are non- refundable or exchangeable. I will not be held responsible for items lost or damaged in transit . Items are shipped worldwide within 48-72 hours (excluding weekends and bank holidays) of payment via Registered EMS / Datapost. A shipping confirmation email will be sent including tracking number. Specific custom orders may take a little longer depending on item (please contact me for details). As each piece is handmade and unique, there may be very slight variations to photos that you see. •Sterling silver Jewellery can tarnish and sometimes yellow so please try to avoid keeping in direct sunlight. •Perfume sprayed directly onto jewellery can also affect silver and some threads. •Gold filled should not be mistaken for gold plated. It is much more valuable and tarnish resistant. •Gold filled consists of an actual layer of gold that is pressure bonded to another metal. •If properly cared for, your gold filled product can last a lifetime and thanks to its durability, there's no need to worry about wear. •Anyone who can wear gold can wear gold filled without worries of any allergic reaction. - Silver & gold filled jewellery can tarnish so please try to avoid storing / keeping in direct sunlight. -Perfume sprayed directly onto jewellery can also affect all metals and some threads. All dzinebug orders come carefully packaged in handmade & handstamped cotton pouches. Perfect for gifting and storing your unique jewellery! I love working with people to create extra special personal jewellery pieces. So, don't be shy - send me a message with what you have in mind and I'll let you know if I can make it for you. All sizing details and options are clearly stated in the description for each listing. Please note all information stated and feel free to get in touch with any questions before placing your order. •Please note, the above are estimated times given by the Post Office. •From experience international postal services have been very reliable and on many occasions buyers have received orders earlier than expected. Thanks for the understanding!